In Lebanon, rain from the latest storm was seen dripping through the cracks in Beirut’s bridges. This image aptly summarises the country’s deteriorating infrastructure, which is due to woeful public finances and decades of negligence. Until now, the focus has been on improving the resilience of the financial and banking systems, and immediate structural reforms, to prevent default and financial crisis. However, this has ignored a number of long overdue and necessary reforms in public spending and revenue collection, which could significantly reduce the fiscal deficit. Lebanon’s public deficit currently stands at 8.3% of gross domestic product (GDP), meaning there is little fiscal space for any type of capital expenditure or fiscal stimuli (World Bank, 2018). Its gross public debt amounted to 153% of GDP in 2017. There are three main expenditures contributing to this deficit: wages and pensions, interest payments on debt, and transfers to the national electricity company. These together making up roughly 76% of total spending in the last decade. Personnel costs make up the bulk of expenditures, constituting 56% of primary expenditure in January 2018. With the uncalculated yet overdue public salary scale (Law #46 implemented in September 2017), the wage bill has increased, making it even more unsustainable. Also, the public sector employs roughly 300,000 people, much more than what the country needs. Reducing the size of the public sector is important but it overlooks a detailed analysis of the drivers of wages and benefits. Figure-1 below shows the breakdown of public salaries, wages and related benefits by personnel type in January last year. 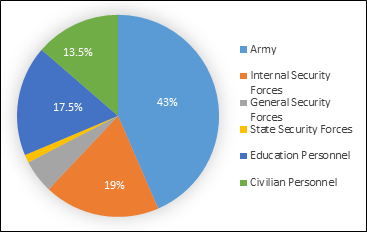 The highest proportion of the wage bill is spent on the military (army and security forces personnel), education and civilian personnel (Parliament and line Ministries). Of the civilian personnel, the Foreign Affairs and Justice Ministries, and Parliament make up the largest proportions, accounting for roughly 31%, 12%, 10%, respectively of the total (Ministry of Finance Lebanon, 2018). More specifically, pensions appear to be the most generous of benefits, although they vary among employees, with some, such as the army and judges, having very generous schemes compared to others (Le Borgne, 2016). For example, retired senior army and security officers can receive substantial compensation, reaching up to a US$300,000 lump sum in addition to monthly pensions and full medical coverage (Le Borgne, 2016). Figure- 1: Breakdown of salaries, wages and benefits as % of total wage bill, January 2018. Source: Ministry of Finance Lebanon, 2018. In a while, public sector reform has been off the table due to the dynamics in hiring. In light of an economy dominated by unproductive sectors, policymakers use public employment opportunities and benefits in return for political support, a process that has been in practice since the end of the civil war. Similarly, a reduction in pensions and benefits, especially for senior civil servants, will be difficult to implement due to vested interests. 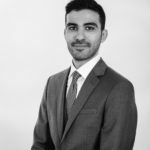 As a best case scenario, a suitable civil service reform would need to not only consider the size of the public sector and its wage bill, but also the way it’s being run. A broader overhaul must extend to the way the civil servants are hired, monitored, and rewarded. The government relies on a narrow tax revenue base, which primarily comprises indirect and regressive taxes, like value added tax (VAT). According to Ministry of Finance statistics, in 2017, the highest tax revenue item was domestic taxes on goods and services, mostly VAT (28% of total tax revenue). By contrast, the combined contribution of direct, progressive taxes on income and profits from both individuals and corporations is comparably low and averages 17% of total revenues over the past decade (Mahmalat, 2018). In macro terms, revenues in 2015 from VAT amounted to 4.1% of GDP compared to 1.4% for income tax on profits (IMF, 2017). When compared to other countries in the region, Lebanon is lagging in terms of generating revenues from income based taxes. Both the corporate and personal income taxes are the second lowest among oil-importing Middle East and North African (MENA) countries — and these two rates are only lower in Jordan (Ibid). Figure 3 compares tax revenue in Lebanon to those of neighbouring countries. What is striking is that Lebanon’s per capita GDP is the highest among all other listed countries. In fact, in 2016 the GDP per capita in Lebanon was almost triple and double of that in Tunisia and Jordan respectively. 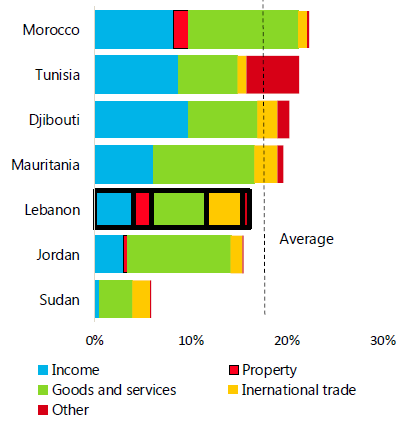 Figure-2: Tax revenue in MENA oil-importing countries as % of GDP. Source IMF, 2017. Although Lebanon’s GDP per capita places it in the high middle income bracket, income is extremely concentrated. The top 0.1% of the adult population (approximately 3,000 individuals) earns nearly the same amount of national income as the bottom 50% (1.5 million individuals) (Assouad, 2018). Accordingly, the county ranks among the highest in the world in the level of income inequality. Figure 3 below compares the share of the top 10% of income earners (out of national income) in Lebanon to a number of selected countries. Figure-3: Top 10% income share: Lebanon vs selected countries. Source Assouad, 2017. Hence consumption based taxes that all citizens pay equally are not capturing the dispersion in income levels. Therefore, Lebanon needs to improve the design of its tax system to generate more revenues from progressive income based taxes. Incentives for Parliamentarians to move to a fairer system are low. As the continued bickering over a new electoral law shows, tax reforms will also be hard to implement due to vested interests, patronage, and the close links between legislators and the wealthiest segments of society. Furthermore, no matter how progressive or fair a new tax system would be, tax morale would likely remain low in light of bad public service delivery and general mistrust. Reforms in the presence of an accountable well-functioning state can help decrease deficits, increase capital expenditure, and hopefully see the repair and renewal of Lebanon’s crumbling infrastructure. Lebanese people must understand that the current dynamics between them and the state, which might be benefiting some, are in fact negatively affecting the whole country. Changing the state of public sector hiring and the tax system will help narrow deficits and reshape the social contract. Le Borgne, E. and Jacobs, T. (2016). Lebanon: Promoting Poverty Reduction and Shared Prosperity, Systematic Country Diagnostic, World Bank Group, Washington DC. World Bank (2018). Lebanon Economic Monitor: De-Risking Lebanon, World Bank Group, Washington DC.